Apologies for being so slack lately with the posting. I purchased this product a few weeks ago from Target and wanted to give it a fair shot before posting a review. REVIEW: For my skin, the oils were a bit much for a scrub. I have combination skin and this was just too much for me, even in the driest of spots. The scrub itself works fine, but when I use a scrub, I like for my face to feel clean and "brand new." This product was just the opposite. 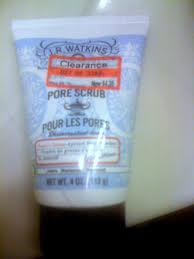 It left my skin feeling oily (like I needed to use my St. Ives scrub) and just not clean. If I didn't use a moisturizer after cleansing, this might would work, but for me, it's just a bit too oily (hence grape seed oil being the second ingredient). All-in-all, I don't completely dislike the product. I may actually love it once it gets really cold here and my skin is screaming for some extra moisture. However, right now, or in the summer, I can't see using it.